Saturdays & Pancakes. Pancakes & Saturdays. Either way you look at it, Saturdays and pancakes are quite the perfect pair. And because husband and I are trying to really enjoy our free weekends together, Saturday breakfasts are turning into a thing in the Hill household. 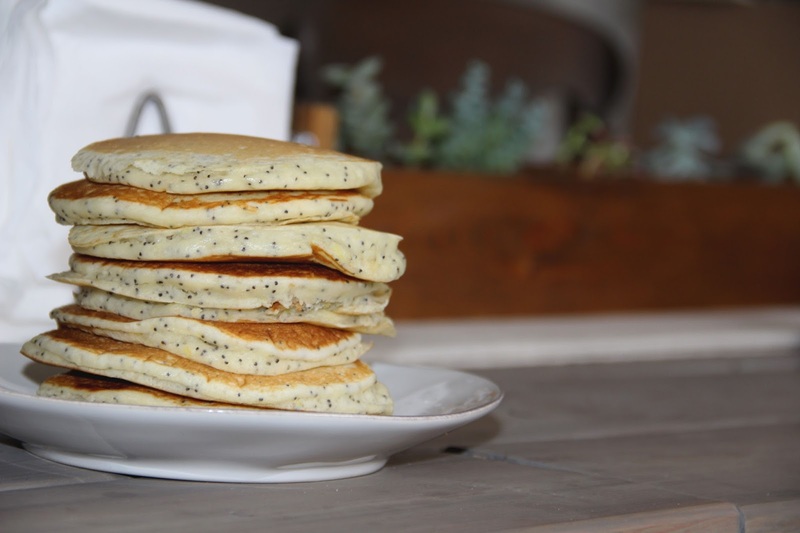 With a recent love for most things lemon, especially when it's freshly-squeezed, I wanted to try my hand at homemade lemon poppy seed pancakes. 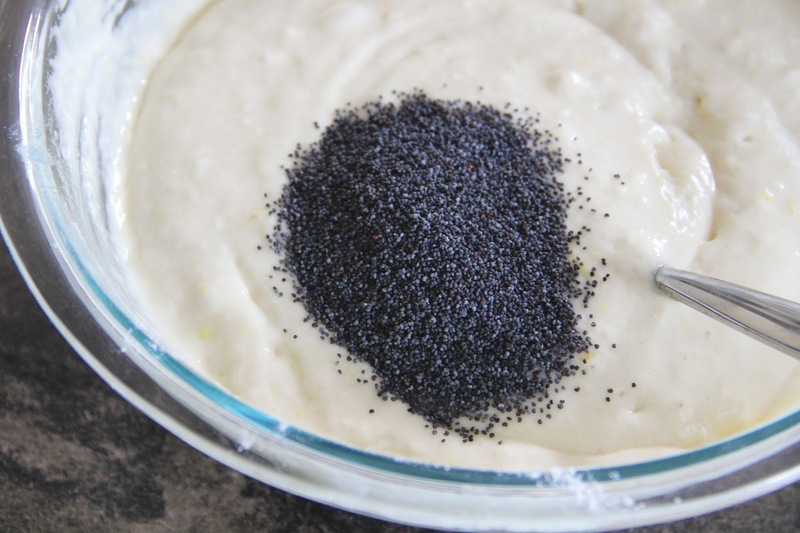 There was nothing to do, time was ours, and the morning was uncomplicated this past Saturday, so I took the opportunity to whip up a bowl of some scrumptious pancakes with the prettiest poppy seeds and freshest of lemons. In a mixing bowl, combine the flour, salt, 1/4 cup of sugar, and baking powder. 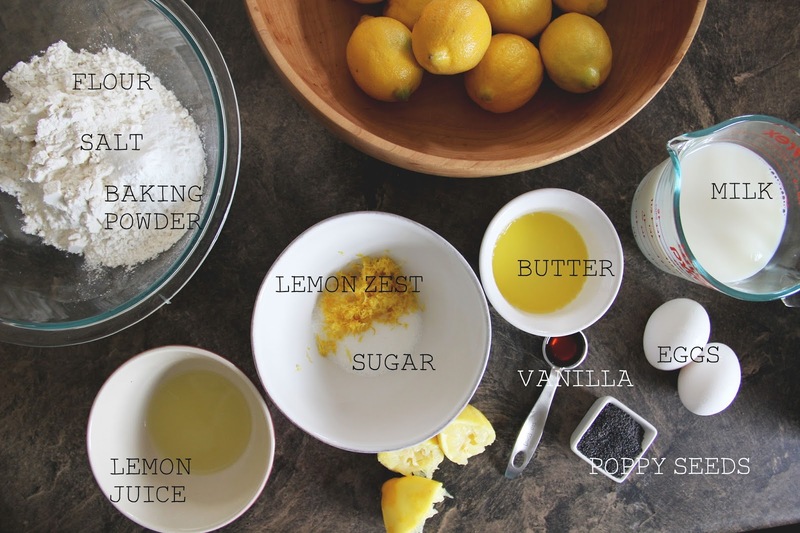 In a separate bowl, combine the 2 tablespoons of sugar with the lemon zest. To mix thoroughly use your fingers. Then add the mixture to the dry ingredients. Stir well. In a bowl or large measuring cup, add the milk, lemon juice, vanilla, and eggs. Beat/mix well. Then add to the mixing bowl of dry ingredients. Stir well. Add the melted butter and the lemon poppy seeds to the batter and stirring well. On medium, heat a pancake griddle/pan for the stove, spray with olive oil. Using a 1/4 cup, scoop out the batter into pancakes. Flip once the pancakes appear to be bubbly. 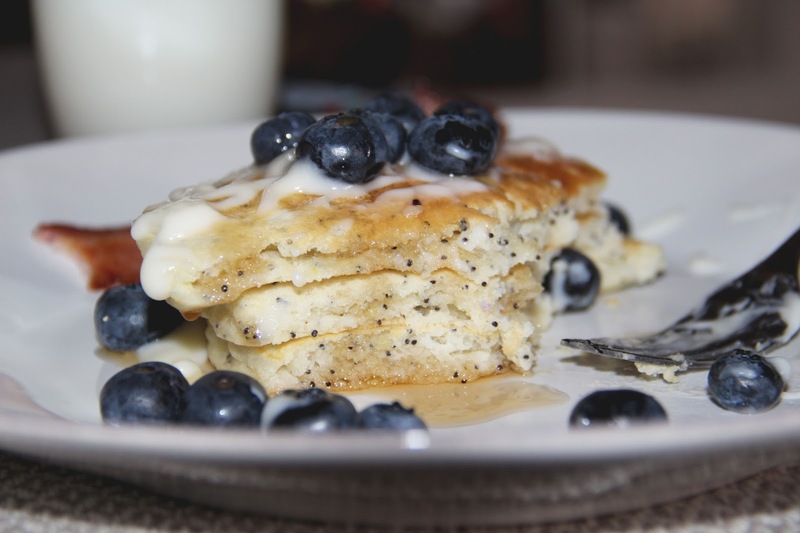 Top with lemon cream cheese glaze (recipe below), blueberries, and syrup. 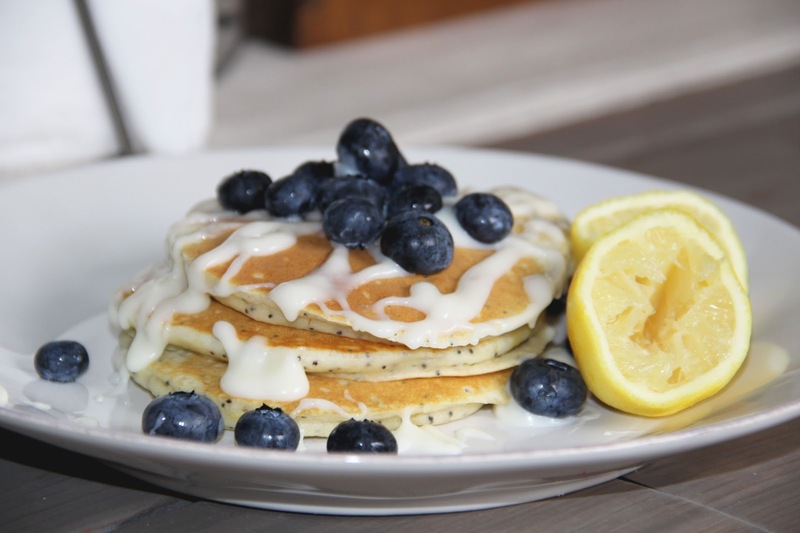 With extra freshly squeezed lemon juice, some cream cheese, confectioners sugar, and milk, you can create a lemon cream cheese glaze to drizzle over your pancakes. Let the cream cheese soften (put in the microwave for 15 to 20 seconds if necessary). Stir the confectioners sugar in slowly, adding the milk and lemon juice next. Taste test along the way to reach the desired flavor. Have a fabulous Saturday full of pancakes and the best of things!